After 200 years of neglect, recent local and international organisations including UN agencies and Muslim Governments have taken interest in the development of waqf institution to make them achieve their maximum potentials. Waqf institutions are now motivated and concerned individuals are dedicating to contribute to the development and enhancement of these properties. Offering this short seminar is one of the efforts for the above purpose. 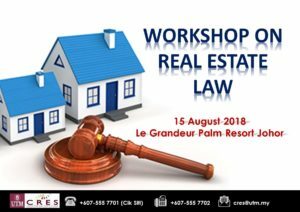 It will introduce the participants to the special characteristics of waqf properties, suggest the appropriate methods of management for waqf properties so that their value is enhanced and put to the best use. Attention will be paid to income generating properties for the purpose of maximizing income which can assist greatly in the positive development of the ummah. 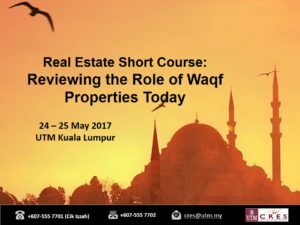 The seminar is highly recommended for administrators of waqf properties, property managers interested in waqf property management, student’s intent on specialisation and anyone who have interest in waqf properties for the purpose of use and enjoyment or donating their properties for causes they intend to contribute. 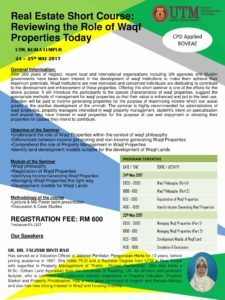 Understand the role of Waqf Properties within the context of waqf philosophy. Differentiate between income generating and non-income generating Waqf Properties. Comprehend the role of Property Management in Waqf Properties. 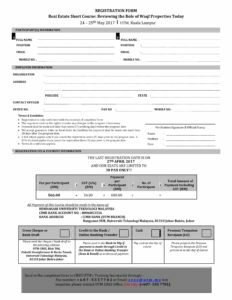 Identify land development models suitable for the development of Waqf Lands.